Celebrate 3 Decades of The Grateful Dead - Spring 1990 Tour with Friday Music's Stunning Super Limited Edtion 4 LP Box Set ! The legendary Bay area rock superstars the Grateful Dead scored with a plethora of wonderful recordings throughout their incredible career that encompassed nearly four decades. Their concert tours were of legendary proportions, and during the late eighties, a whole new audience was discovering their magic thanks to their hugely successful "In The Dark" and "Built To Last" albums. This success brought the band back out on the road for several more tours, and the "Spring 1990" performances look to be some of the finest ever in their long history. Always known for being on top of the audiophile medium, the Dead would record a lot of their shows over the years with state of the art equipment. This particular tour was of exception as long time producer John Cutler recorded a number of shows during this much touted tour era and together with Dead archivist David Lemeiux compiled the long awaited "Spring 1990 · So Glad You Made It" album. 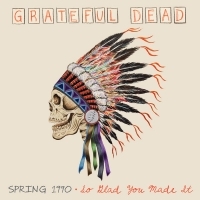 Friday Music is very pleased to announce the amazing 180 Gram Audiophile 4 LP Box Set of the Grateful Dead’s "Spring 1990 · So Glad You Made It". This super limited edition Dead treasure trove highlights selections from five of their finest shows from this legendary tour. Filled with twenty stellar performances, The Grateful Dead’s Jerry Garcia, Bob Weir, Phil Lesh, Brent Mydland, Mickey Hart and Bill Kruetzmann truly radiate with some of their finest playing and singing ever, making this a wonderful listen and collectible album for years to come. Many favorite Grateful Dead classics and superior rarities abound in this lengthy audiophile dream box including the long-awaited release of "Loser" from the 3/24/90 concert in Albany, NY and several rare Brent Mydland performances like "Easy To Love You", "Blow Away" and "Gimme Some Lovin". Known for their lengthy jams, four solid masterpieces get their due on this amazing set like the Landover, MD 3/16/90 performance of "Scarlet Begonias / Estimated Prophet" and "Playing In The Band / Eyes Of The World" from the Hartford, CT show on 3/19/90. The band went back real deep into their arsenal of classic tunes and picked even more of their most loved repertoire including a fine reading of Tim Rose’s "Morning Dew" and the wonderful album closer "Attics Of My Life". As an added treat, a pair of killer covers made famous by the Rolling Stones found their way into the Dead’s set list this tour with brilliant revisits of "It's All Over Now" and "The Last Time". Mastered for audiophile vinyl by Joe Reagoso & Jeffery Norman at Friday Music Studios and at Capitol Records, Hollywood, CA, this wonderful super limited edition box set will truly be a welcomed addition to your Dead collection. The Grateful Dead’s "Spring 1990 - So Glad You Made It" album is packaged in a stunning box set, with Wes Lang’s artwork detailed beautifully, with a poly lined LP sleeve to preserve the rich details of each of the four 180 Gram vinyl albums, including wonderful custom LP label artwork provided for each vinyl album.